Have children bring to the daycare a toy, a book, or a stuffed animal related to the theme. Add pictures or figurines of various polar animals. Have children bring to the daycare a toy, a book, or a stuffed animal related to the theme. Add pictures or figurines of various polar animals. Gather all objects and display them in the centre of your circle time area. Select an object and have children tell you everything they know about the animal. You may also use a book to discuss animals which live in the arctic year round or those which migrate north. We suggests an imaginary game to begin each day (Open Thematic letter - Whitey White). Print the letter and place it in an envelope. Leave the envelope in an easy to find location within the daycare. During circle time, have children find it and read portions of the interactive story to them each day. Transform your daycare using large white sheets or white cotton padding. Children will love to sit on the white " snow ". 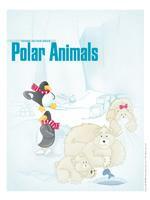 (Open activity sheet - Polar Animals) Print and laminate. Using a dry erase marker, children will practice connecting the dots, 1 to 10. The pictures may be used as a memory game or to spark a conversation with the group. Use them to decorate the daycare or a specific thematic corner. (Open picture game - Polar Animals) Print, laminate, and store in a " Ziploc " bag or in your thematic bins. The flashcards may be used during circle time to spark a conversation with your group or in your reading and writing area. They may also be used to identify your thematic bins. (Open word flashcards - Polar Animals) polar bear, seal, penguin, fishing, igloo, iceberg, emperor penguin, whale, walrus, ice, Inuit, fish. (Open Game - Where do animals live?) Print and laminate. Using Velcro, children associate the animals to the correct habitat. Play music. When you stop the music, show children a picture of a polar animal. They must imitate the animal. When the music starts again, children resume dancing. 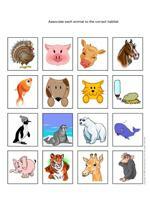 Use the polar animal picture game for this activity. Select a child to be the bear. He hunts the other children, attempting to touch one of his friends. When he succeeds, the child he touched becomes the polar bear. Variation: When a child is touched by the polar bear he must stop moving and stand with his arms stretched out. He may begin moving again if another child passes under his arms. Select a child to be the penguin. With the other children, sit in a circle around the penguin. The penguin goes around the circle, walking like a penguin, trying to make his peers laugh. The first child who laughs becomes the next funny penguin. Glue four pieces of white felt on a large piece of cardboard. Hang on the wall. With children's help, trace and cut out various shapes from colored felt. The shapes will stick to your white felt board. Change the shapes according to the season and theme. We have prepared shapes for the current theme for you (Open Felt board game - Polar Animals). 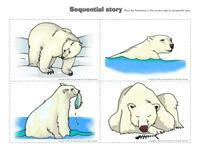 (Open association game - Polar animals) Print and laminate the two series of polar animal pictures. Display the various pictures for children. Have them associate the various missing parts to the correct polar animals. Drape white sheets over a table. Deposit a bin filled with snow and winter figurines in your "igloo". Add books about polar animals too. Children will enjoy playing in their igloo. Prepare several ice cubes with the group. Children find water turning into ice very interesting. The next day, let children use the ice cubes to build small igloos of their own. Place a large block of ice like the ones used in coolers in a storage bin. Invite children to play with figurines on the "iceberg". Show children how quickly the ice melts and how it turns into water. Prepare a sugar, salt, flour, rice, or snow bin. Children can discover new textures while playing in the bin with figurines and polar animals. (Open models - fish) Print and have children color the fish. Laminate and cut out the fish. Add a paper clip to each one. Tie a piece of rope to a broomstick or a skewer (remove pointy end). Attach a magnet to the end of the rope. Have children fish. You may be behind a couch or another piece of furniture to ensure the fish attach to the magnet. Make sure children are all given a turn to fish. This game may be played outside, hide behind a snow bank. Prepare an obstacle course for your group. Children choose their favorite polar animal and imitate it throughout the obstacle course. Dig a den like a polar bear. Attempt to climb an icy surface like a walrus. Walk clumsily in the snow as would a penguin. Hide in the snow like a fox. Eat cookies shaped like bear paws. Imitate biologists studying the outdoor animal world. Provide children with small notebooks, pencils, and binoculars. Hide pictures of polar animals outside and put your little biologists to work! Make a pastel color out of a darker color. Explain the phenomenon of the arctic fox. His brownish-gray fur becomes white in winter. With your group, melt a bowl of marshmallows in a microwave oven for 30 seconds. Give each child a turn to stir. Return to the microwave oven for another 10 seconds. Deposit the melted marshmallows in the center of the table. Children use marshmallows to build an igloo using the melted marshmallows as "glue". Show children how to make slush using crushed ice and juice. Let them enjoy mixing their slush with a spoon. Find a large piece of cardboard. Have children paint it white. Throughout the week, children create their very own arctic world. Offer plenty of white items such as marshmallows, sugar, salt, flour, salt dough, white modeling dough, white glue, cotton balls, Styrofoam balls, Kleenexes, egg shells, egg carton cavities painted white, etc. (Open craft - polar bears) Children glue cotton balls inside the polar bear shape. Have children draw an imaginary polar animal on a white sheet of paper using a white crayon. Have them present their animals to the group. The white crayon on white paper stimulates children's imagination. The walrus' nose is very prickly. Show children a picture of a walrus. Provide children with modeling dough, toothpicks, and straws. They can create their own walrus noses. Glue cotton balls and white feathers on a piece of paper. Add wiggly eyes. You may draw the outline of your owl before you begin to make this activity easier.